MM Does TT: Simply Z Best? 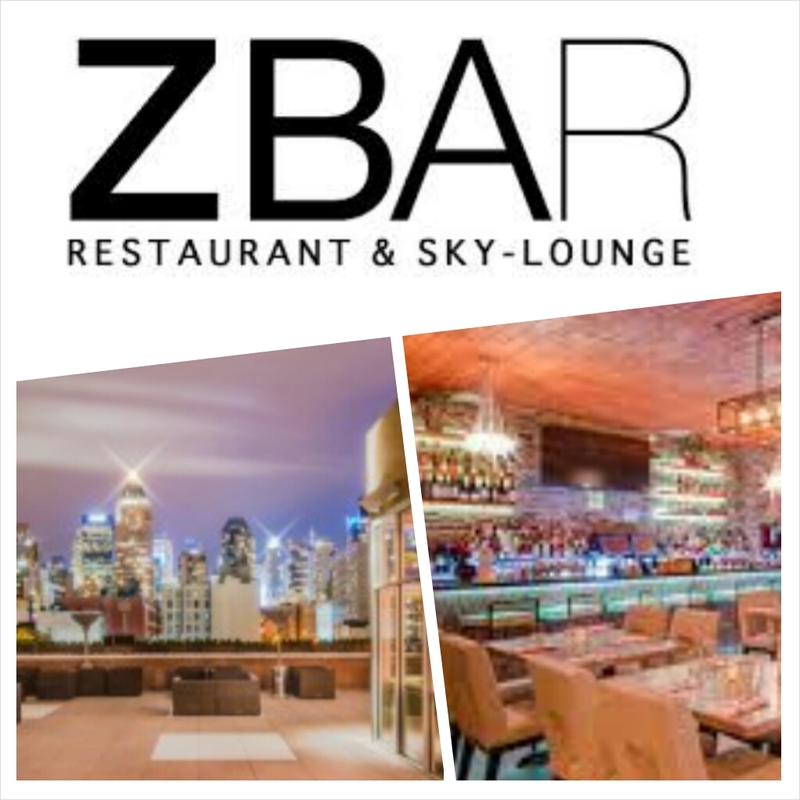 Due to another great online deal, the Mavericks went to ZBAR Restaurant and Sky Lounge on a Tuesday evening (it’s closed on Mondays), which made changing the name of our weekly dinner to “Tasty Tuesday” necessary. Having had our share of myriad tapas from all over the world and because Marissa had dined at ZBAR awhile back, I believe I subconsciously set the bar higher than usual. New York City has some pretty high caliber tapas bars and Spanish restaurants, so I really hoped this place wouldn’t disappoint. Being that ZBAR is a rooftop venue on the far west side of the city by the Hudson River, the eastern view of the Manhattan skyline was quite exceptional, and the floor-to-ceiling glass windows showcased it wonderfully. The bar/restaurant was trendily clad in white leather and brushed steel and dark wood seating, stone accents, mood lighting, and well-stocked liquor shelves. Their creative and delicious sounding cocktail menu thoroughly whetted my appetite for sinful libations, but I held off so I could properly enjoy our bottle of wine. All I could hope was that the ambience and presentation of the food (I did my research online and saw food pics) weren’t all fluff and no substance. The rundown: It was a nice touch that we were given a complimentary amuse bouche of raw salmon flavored with sesame oil atop shredded cucumber; light, fresh, and just enough to get our taste buds warmed up for more, although I wasn’t quite prepared for the Asian-inspired flavor it offered due to the sesame oil (friggin’ fusion cuisine, I tell ya). The first dish we sampled was ZBAR Mussels; the description totally didn’t match the reality. Where do I begin? Oh yeah, I remember because the overcooked little babies that were shrunken in their shells are hard to forget, unfortunately. Once I saw them I knew this was probably the only time I’d ever been happy to get a small portion. I didn’t taste any hints of chorizo oil or fine herbs, unless they were so fine they were undetectable. And I’d love to tell you whether or not I enjoy cabrales cheese, what it feels like and how it tastes, but I can’t because it was completely absent from the dish! Oh, let’s not forget the “garlic crouton.” Garlic crouton…is that what I read? You read that too, right? I’m going to call it what it really was, un-garlicky burnt toast. While I’m at it, here’s another misnomer for you: “tomato confit.” Tomato confit? How about tart and chunky tomato broth instead; I’d rather eat San Marzano tomatoes out of a can—same effect. So now I’ll ask you lovely readers, do you think the rest of the meal was just as tasty? I know you’re anxious to see what happened next. *cue evil laughter* … Mwa ha ha ha! The Mexican Ceviche was tomato sauce with a few shrimp and unripe avocado hiding in the depths. This place really had a thing for tomatoes, because with all that sauce I don’t even remember if there was any jicama in the dish. As we’ve already seen, the menu descriptions were not at all indicative of what was actually plated, for I surely read jicama and not tomato sauce when I ordered this. Can you double check in case I was mistaken? Thanks for confirming that for me; I figured as much. The only item that lived up to its description and tasted good was the Carnitas de Atun; I have no complaints for that one. The Truffle Mac n Cheese was decent; seasoned well, but not enough truffle flavor, and the lobster was not dispersed throughout the mini trough, it was just the one claw that they sat on top for presentation. It definitely wasn’t worth the $20 price tag. I’ve had better for less money. The Mexican Vanilla Brulée Cake was so light and airy, I wasn’t sure I was eating anything. It was too subtle! Crunchy crumbs mixed with vanilla foam did not make for a pleasurable experience. Bad on top of bad. Wonderful conversation and company not included (as usual), the only thing I truly was the bottle of wine. Thank you baby jesus that they don’t own the winery! Marissa, I hope your last dining experience there was 1000x better than ours. ZBAR, if you’re reading this, just stop with the fake fanciness. You’re clearly not an haute cuisine establishment, so enough with the false pretenses. I beg you.